I handed the chamois cloth covered funnel down to my Dad and skinnied off the wing of the 185 making sure to stay free of the flaps. He caught my foot and hucked me into the canvass rear jump seat while our friend and pilot went through his pre-flight routine. It is 1968. Fog, drizzle and an incessant mid-August southwest wind drenched our hopes for a straight shot to Illiamna, but that's life in the “Bay.” Instead, we would pick our way through holes in the Alaskan weather. The pilot opened the window-"clear1?" 12 big volts and plenty of amperage jolted the Bendix into the ring gear of the engine and the propeller lurched in circles. A couple puffs of smoke signaled combustion and the sweet rhythm of a well maintained power plant melded with the air. I felt my Dad heave against the lattice of the floats and heard his hip boots stomp on top of the pontoon. He deftly slid into the right seat, buckled in, slammed the door, tested it and boomed, "ready!" Those two ol boys had flown together for many years. The co-pilot on this run was a B-17G combat pilot and our pilot, a Navy Corsair pilot. As for me, my right arm wrapped around our fly rod tubes. No longer a “snot-nosed kid,” I'm sixteen and get to go with! Nothing sounds like the rank arrogance of a Continental 300 at full power. The Cessna rared back on her haunches as she pulverized the atmosphere. The floats had no choice but to get “on step” and plane out. G-forces pushed me against the seat back for a few seconds. Jake tipped the wings to break surface tension and we were flying baby! Still love watching rain drops atomizing against the windshield, traveling straight yet oblique lines to the top of the fuselage and disappear. Banking over the Naknek River, we headed north and east. Destination? Lower Talari Creek. Yeah, yeah, most call it Talarik, Trout Unlimited announces Talaariq, but the locals and native people I spent my summers commercial fishing with called it Talari. Good enough for me. Back in those days, Lower Talari Creek was a straight stretch of stream running parallel to the big lake. It connected an upper lake to a lower lake before breaching the sea berm and dumping into Illiamna Lake. The “crick” was gin clear. We could see fish from the air. They looked like Silvers, but weren't. You know what they were don't you? :) Yup, 10lb++ Rainbow Trout and plenty of them. There wasn't a soul in sight. We slid down the starboard wing, flared and ever so politely caressed liquid on the upper lake. I could barely detect the transition from flight to waterborne status. We taxied to the north bank of the creek, imperceptibly nudging to a stop.... like usual. Click, click, the seat belts came off and the right door opened. Still raining and blowing. I was half electric; no, mostly electric! I fumbled around and grabbed our lunch, a thermos of hot “mud” and handed them to Dad. He tossed them on the tundra, whereupon I handed him the fly rods and gear bailing out in one motion. Great to be young! Jake had paying customers and couldn't stick around. “Be back later tonight!” We pushed him off the beach spinning the aircraft 180. The engine roared to life and he was gone. Lake Illiamna busted against the beach and Lower Talari flowed. Without the worry of two legged interlopers and most of the four legged furries were up the West Fork gorging on remaining salmon and berries, the two of us took the time to sheath ourselves in rain pants over hip boots and rain jackets over wool shirts. On our topknots, the sou'wester protected. Can't touch us now! Clear water flows both ways as it pertains to an anglers success. Upstream, it is a distinct advantage to see the fish and orient the placement of a fly. 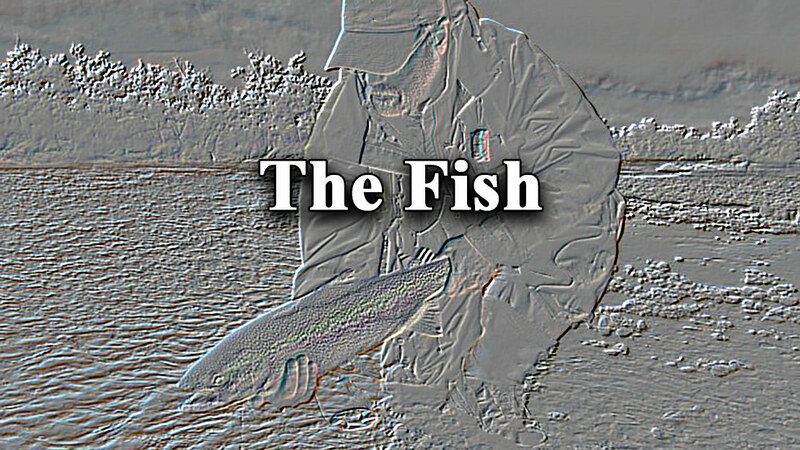 Downstream, the fish sees the angler and oft times become shy and aloof. Such was it on this day. We stayed back from the stream and made our way down a hundred feet or so to a shallow draw where we set our rods up. My Father unlimbered his cherished Hardy split bamboo 6 weight and a Hardy reel that has long since vanished. The outfit came as a gift from a client he'd gotten a righteous Grizzly for in Rainy Pass, early fifties, a fine story in its own right. My shiny new Fenwick 7 weight with a venerable Pflueger Medalist quivered in young hands that rattled with excitement as I tried to lace it up. Finally got the leader through the tip guide, pulled a bunch of line out and tied on a Dan Bailey's Fly Shop Skykomish Sunrise. Who needs nippers? I bit the tag end off. Dad thrust his needle nosed pliers at me with a gruff “flatten the barb down” and I sure did. He stayed in the draw and eased over to the crick while I headed downstream looking for a place to get in the water. He waited on my steps to get far enough away before going to work. Once I was in the water, I proceeded to wade almost to the top of my boots and unhooked the fly from the first lifting guide. Dad's familiar admonition bounced back and forth in my thick head without him saying a word: “Son yer standing right in the damned fish!” Ah, what does he know? Dead drift after dead drift and nothing. Of course you see, I was standing in the fish; they knew and didn't like it. I heard a “hup” from upstream. Dad was hooked up. This pattern repeated itself for quite awhile as we leap frogged each other toward the lower lake. I was getting hungry and Dad had the lunch, so I waited in a spot shaped like a colossal alevin with a gravel bar on the north side opposite a marsh like feature across the way. Peanut butter and jelly on inch thick pieces of homemade cracked wheat bread slathered with Darigold butter from a salt brine can was divine! Remember? We ate and smiled enjoying the break, sharing the hot coffee, delicious and rejuvenating! The weather wasn't getting any better. After awhile I wandered down to where the creek narrowed, the Skykomish still tied on. Dad switched to a Cowichan. On the swing a few casts later a huge paddle caused the surface to whirlpool with no splash. At once the Hardy was in trouble!! The fish screamed behind me going faster than a Japanese mag-lev; made an unruly u-turn and shot back upstream Mach II. Not good! I grabbed my rod with my left hand pulling the line upstream and back while desperately circling Dad's line with my right fist and threw it over my head. That never works out, but did! Back up on the gravel, I saw the fish hauling the mail into the current, then began a scorching arc across to the marsh ripping water molecules senseless! It reversed back upstream making a 360 loop which it jumped through, tying a knot in the fly line ten feet up from the leader. Dad was stripping line like a wild man when the fish made a ninety degree turn and ran right at us up on the gravel sproinging as though it were some high tensile rainbow colored steel, charged with epic organic adrenaline. Three times did it take the fish to splash water. Again the Hardy winced under the load, then went quiet. I'm dumbfounded! The fish was gone! Father pointed the rod at the water and reeled to the knot and raised the tip till he could grab the fly. Hooks are designed as a hook, this one was straight. “Hmm, I left a burr on it” referring to his incomplete flattening. Even old guys get excited. By then, it was getting dark and the Illiamna weather ensured there was no ride home tonight.